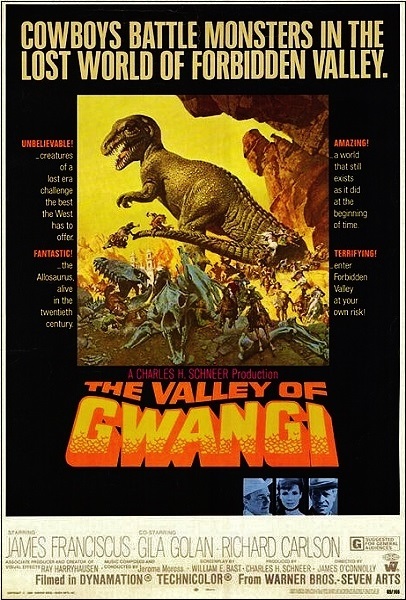 The wild West meets the Jurassic period as we ride into the hidden valley to lasso an episode on the cowboys vs. dinosaurs creature feature The Valley of Gwangi. We comment on how the story borrows from previous dinosaur movies, marvel at the detail and artistry of special effects master Ray Harryhausen's creations, and ponder if the film could serve as an alternate origin story for Devil Dinosaur. Warning: Contains explicit language, spoilers, and pedantry about paleontological accuracy. Do you think Gwangi's hidden valley contains a reservoir of salad dressing? Want to weigh in on whether stabbing a dinosaur with a flag means you've claimed it for your country? Have you or anyone in your family ever suffered from bad post-production dubbing? Leave a comment and keep the conversation going. One of the few Harryhausen films I haven't seen, and yet the episode hits on issues I've had with most of his films. A couple are really good (still think Jason is his best), but as creative as Ray was, many of his works were stunted by not pairing him with strong writers or directors, leaving much of the film surrounding his effects largely mediocre and bland. He never really found that key collaborator who took his work and ideas to the next level, which is a shame. I wonder if part of that may be that with Harryhausen's effects being the primary draw for audiences, his longtime producer Charles Schneer felt there was less need to find just the right script or an enthusiastic director and that decent actors would be enough. I imagine few A-list actors of the period were willing to play second-banana to a cyclops or a giant vulture. I do think the movies where Harryhausen's creations are the focus worked better. This movie wastes far too much time on Franciscus and Golan's love story when we just want to watch Gwangi do his thing. Meanwhile you look at Beast From 20,000 Fathoms or Twenty Million Miles to Earth where everything in the movie revolves around the monsters and those films work so much better. And I totally agree: Jason is the best.